iPhone backups contain a huge amount of personal data, from various account and service logins, contact list and phone logs, personal notes, emails, health data, messages, fully readable SMS conversations, just about anything that is used or stored on the device gets placed in the backup file. That’s excellent for backup restoration purposes, but technically anyone with access to the computer can easily dig around in the backups locally if they wanted to. For this reason, it can be a good idea keep these locally stored iPhone backup files encrypted, which then require a password to access and restore from, and it also makes the backups safe from prying eyes. Enabling backup encryption for iPhone (and iPad and iPod touch for that matter) is a simple procedure that must only be enabled once. After encryption has been toggled on, all backups will be placed through encryption, and all future backups that are made will be encrypted, making them unreadable and unusable without having the accompanying password that was set. This allows for a very secure layer of privacy and security for stored iOS data on any computer. This tutorial will show you how to enable encrypted backups in iTunes for Mac or Windows. 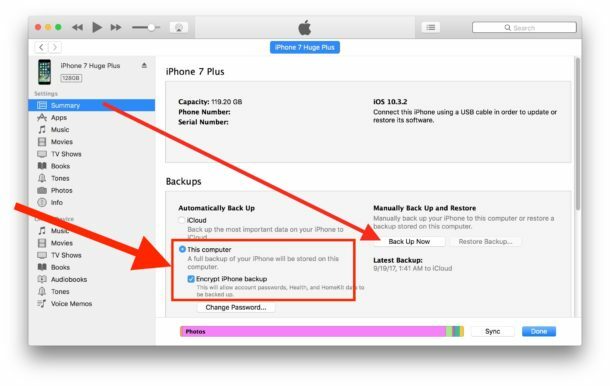 As long as “Encrypt iPhone backup” is checked and enabled in iTunes, the backup will maintain encrypted on the computer. A tip for Mac users with complex passwords, or if you want the option to recover lost encrypted iOS backup passwords, you’ll need to check the box for “Remember this password in Keychain”. What that does is make the password remembered by Keychain which is then guarded by the system-wide administrator password. That option is not available to Windows users however. This is very important: Do not forget this encryption password! Without it you will not be able to access backed up data, ever, because it is encrypted with extraordinarily strong protection. Likewise, you will need to enter the password anytime you restore your iPhone from the backups that have been kept locally, otherwise they will become inaccessible along with all data contained within them. OK I encrypted iPhone backups to iTunes, what about encrypting iCloud backups? Do note this applies to locally stored backups that have been made from iOS devices through iTunes and stored onto a computer, and not iCloud. This is because backups created and stored with iCloud are encrypted automatically and stored on protected servers through Apple, making them only retrievable by using the Apple ID and login information associated with the Apple account. 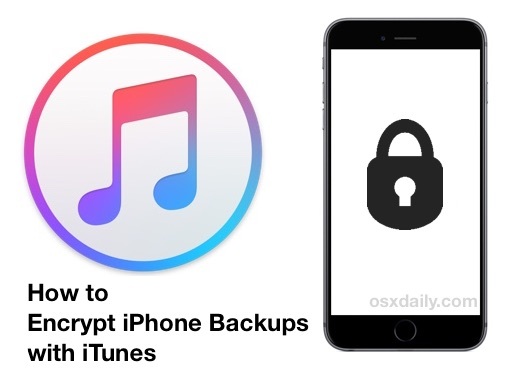 Thus you only need to encrypt the local backups of iPhone or iPad devices made with iTunes. For further securing your iPhone, don’t forget to set a lock screen access passcode too. You can also take the passcode a step further by activating the “self-destruct” feature of iOS which will automatically erase all data on the device after multiple failed login attempts, though one must be cautious with that feature since someone could inadvertently erase the data on the device simply by entering the wrong passcode. Regardless the setting you’re looking for is the same and will be something along the lines of ‘Encrypt iPhone backups’. This is an *absolute must* enable, it amazes me how many people do not even set passwords for their Macs or iPhones. What if something was stolen? Don’t make it easy for thieves or snoopers, always use passwords and encrypt when you can. There’s just too much data that you undoubtedly want kept private. Think about when the iPhone 5 includes the NFC chip and becomes tied to your bank account, get in the habit now. I forgot my password, how can I reset it or set a new password for the encryption backup ? how to decrupt or remove the encryption? please see image n my problem. its disabled, even when i enter the correct username and password. I have a problem with setting my password for the backup…it won’t accept any pass i typeit just says “The password you entered to protect your iPhone backup file could not be entered. Please try again” Can someone please help? I can’t emphasize enough how importantly simply setting a 4 (or more) digit lock screen passcode is.